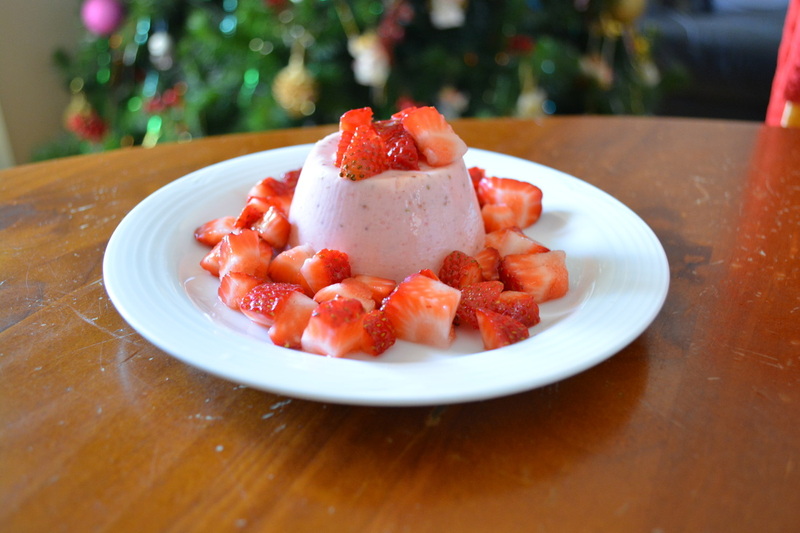 This pale pink strawberry pannacotta is just beautiful, beautiful to look at, beautiful to eat. It is yoghurt based so it has this lovely flavour that is quite refreshing. This is so easy to make, one of the easiest desserts you could ever make. I used a coarse sieve, so a few strawberry seeds got through, if you want it super smooth, use a fine sieve. I wrote down 3-4 gelatine leaves as different brands come in different sized leaves and recently I tried making it with 4 leaves and it was like rubber. So I tried again and this time used 16g or three leaves and it was perfect. So, I will now weigh my gelatine leaves for more accuracy. Give this a try, they are beautiful. Place yoghurt and 400g strawberries in a food processor, blitz until smooth. Strain the mixture through a sieve into a large bowl to remove the seeds. Place the cream and sugar in a medium sized saucepan, place over a low heat, stirring to dissolve the sugar, bring it to a simmer. Place the gelatine in a bowl, cover with cold water, soak until the gelatine is soft. Squeeze out the excess water from the gelatine leaves, drop the leaves into the hot cream and stir until completely dissolved. Remove from heat and quickly stir in the strawberry yoghurt mixture. Divide between six 125ml plastic dariole moulds, cover with lids (or cling film) and chill for 8 hours or overnight. Thirty minutes before serving, hull and dice the remaining 200g strawberries, sprinkle with the icing sugar in a bowl, allow to macerate until needed. To remove the pannacotta from the moulds you can dip them in hot water for a few seconds and then invert onto a plate. I prefer to loosen them by sliding a knife gently up one side of the panna cotta, this will create an air pocket which will help them slide out easily. Turn out the panna cotta onto serving plates. 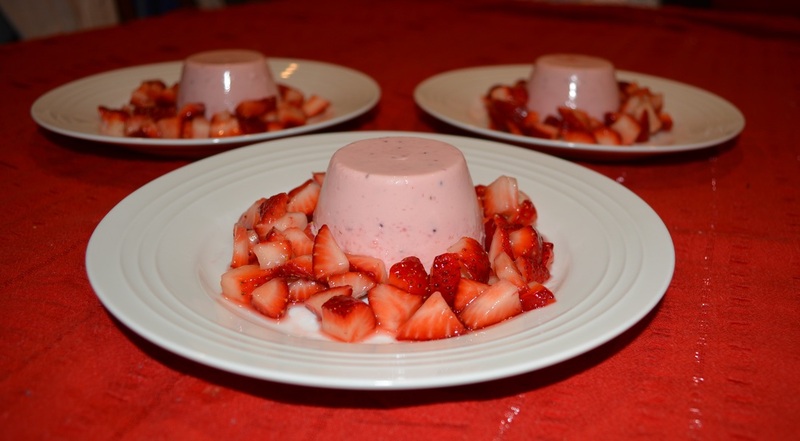 Top each pannacotta with the diced strawberries and serve immediately.